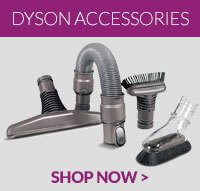 Welcome to the vast array of quality accessories for your Dyson vacuum cleaner available here at 4Your Dyson. You can buy accessories and parts for all models and types, including Dyson motors, filters and hoses. If your Dyson vacuum is not running with the trademark powerful suction, then our low cost replacement and spare parts could return them to their peak performance. Whether you have a Dyson Upright, Dyson Cylinder or Dyson handheld you can be sure to find the correct spare parts and accessories here at 4YourDyson. Browse our full range below and if you require any advice on which option is right for your Dyson call us on 0845¬ 0134003 or visit our contacts page. Genuine Dyson vacuum cleaner combination tool assembly for Dyson DC19, DC19T2, DC26, DC29, DC38, DC3.. Compatible replacement Dyson DC14 vacuum cleaner crevice tool. Fits: All Dyson DC14 vacuum cl.. This item is a genuine part for your Dyson DC39 vacuum cleaner .. Turbo brush floor tool suitable for many makes and models of vacuum cleaners such as Vax, Dyson, Ele..
A genuine replacement part from Dyson. Ideal for replacing broken or worn cleaner heads for most V6 .. Replacement docking station for your Dyson DC30, DC31, DC34, DC35 & DC44 handheld vacuum cleaner..
Dyson handheld crevice tool for cleaning tight and awkward spaces with your Dyson handheld vacuum cl.. This is a compatible spare part to fit select models of Dyson vacuum cleaners ..
Genuine Dyson replacement combi tool for Dyson DC22, DC25, DC27 and DC33 vacuum cleaner models. ..
Genuine Dyson DC49 Turbine head tool assembly. ..